Planning for Guided Reading can be cumbersome and time-consuming. Making sure your students are working on skills appropriate for their individual levels is key. 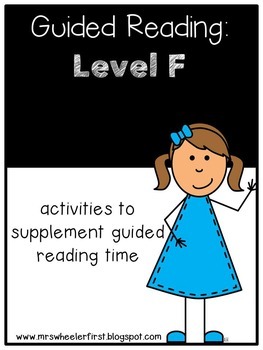 I created this "Guided Reading for Level F" set to be used with your students who are reading at a level F (according to Fountas and Pinnell). This set is jam-packed with the following skills: bossy r, sentence types, syllables, sentence editing, and inference. Make planning a breeze by knowing what skills you're focusing on AND what materials you have to use! Make the most of your guided reading time! *Note: You do not have to use Fountas and Pinnell levels to purchase this pack; it's a pack loaded with fun and engaging phonics, reading,and vocabulary skill practice! Download the preview to see some sample pages. 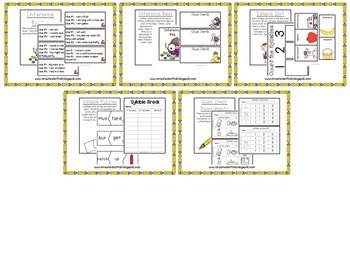 Great for on-level 1st graders, or RTI for 2nd or 3rd graders. Also perfect for home-school parents needing guided reading activities! I organize my materials with binders by level, but I have also organized by skill in my classroom using clear plastic tubs. Either system works really well! This bundle includes a mixture of black and white and color activities. 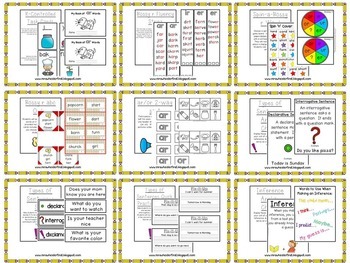 I have printed many activities onto color card stock to "spice them up." Thanks for your interest! Download the preview to see some sample pages. Check out the KINDERGARTEN GUIDED READING BUNDLE HERE!